To create the bird's eye, I used a number six round brush (Silver Black Velvet) with a nice point. I loaded the brush with French Ultramarine Blue and a touch of VanDyke Brown. The combination of the warm and cool colors creates a darker value without using black. I can push the color combination to warm or cool, depending upon which pigment I use more of in the mixture. 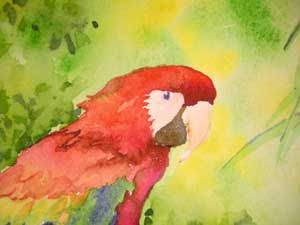 By painting a small comma-shape, I am able to keep the sparkle in the bird's eye.